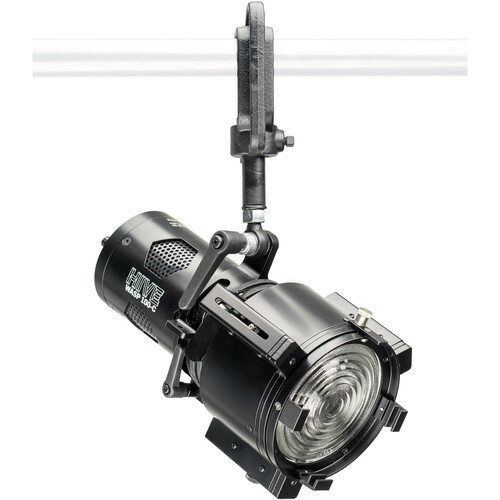 The Wasp 100-C Studio Adjustable Fresnel LED Light from Hive is a lightweight, versatile LED source with a small form factor and superior performance features. The light has a 15-50-degree beam spread for flooding out a silk or for long throw work and selective lighting. The beam can be further modified by the included 4-way barndoors. The 100-C has a bracket to hold the power supply, a studio yoke, and a C-clamp for attachment to a pipe or overhead grid. Control is the key word in the construction of the 100-C. Hive uses what they call Perfect S.H.O.T controls which is an umbrella term for complete control and adjustment of every aspect of light output. Part of the success of the system is due to the use of 5 LED chip blending. Instead of the traditional 3 colors, Hive uses Red, Amber, Lime, Cyan, and Sapphire for nearly infinite color combinations with a high CRI/TLCI rating of 98 and 97. Color can be adjusted from a very warm amber 1650K to an icy blue 8000K. But control doesn't stop there. There's 360-degree hue adjustment around the color wheel as well as 0-100% saturation control. The 100-C can also be dimmed from 0-100%. While of course you can make all of these adjustments manually, you can also make them remotely via your smartphone or onboard DMX. Once you've grown accustomed to the 100-C's features, you'll want to take it everywhere, and thanks to its 100-240 VAC power supply, you can. The 100-C has 0-100% saturation adjustment, 360° hue control, output regulation from 0-100%, and color temperature control from 1650 to 8000K for near infinite combinations to get you your precise balance. The 100-C uses red, amber, lime, cyan and sapphire LEDs instead of the traditional 3 color system to achieve a high CRI (98) and TLCI (97) to render colors faithfully with no output loss or color degradation. The 100-C's functions can be controlled manually (locally) or remotely via your smartphone or DMX. The 100-C is 7.5" long and weighs just 5 lb.